VietNamNet Bridge - Environmentalists have voiced their concern that a cable car system set up to serve tourists will spoil the natural beauty of the world’s largest cave. Five months ago, the world was overwhelmed with reports about Vietnam’s Son Doong Cave broadcasted television channels in the US and Europe. Located in Phong Nha – Ke Bang National Park in Quang Binh province, Son Doong, or ‘mountain river cave’ attracts people with its natural charm and wonderful primitive landscapes. At that time, when local and foreign media all focused on describing the beauty and attractiveness of Son Doong, Lao Dong newspaper published an article titled ‘Niem tu hao va moi suy tu’ (pride and worry), warning that Son Doong’s beauty would be spoiled if it is unreasonably exploited for mass tourism. 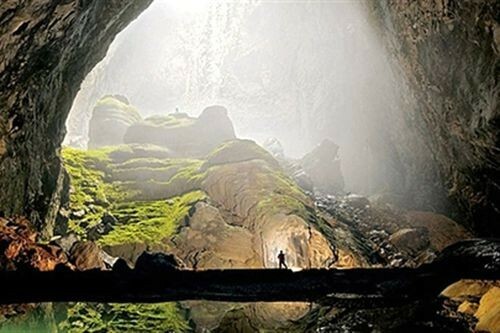 Quang Binh provincial authorities, however, have decided to build up a cable-car system to bring tourists to Son Doong. VNAT’s General director Nguyen Van Tuan at the press conference on October 9 confirmed that a cable system would be set up to carry travelers to Son Doong. The system is designed to carry 1,000 visitors to Son Doong an hour. He said that the cable-car system would not affect the landscapes and the ecosystem in the Phong Nha – Ke Bang National Park. However, environmentalists do not believe that Son Doong will be safe if millions of people travel by cable car to Son Doong every year. Son Doong is attractive because it is primitive. Son Doong is a precious treasure which needs to be cherished. Son Doong is attractive because it is behind a mountain to which not everyone can come. It challenges travelers who have a love of adventure and eagerness for discovery. Son Doong is reserved for those who desire to explore, love travel and those who are willing to walk to reach the remote cave. Son Doong is not the place for mass tourism, a destination for millions of people coming there in cable car in beautiful clothes just to take pictures, post images on Facebook and drop litter. Ta Hoa Phuong from the Hanoi University of Natural Sciences said he opposes the plan to build cable car to bring tourists Son Doong, because it would spoil the rare and precious natural heritage of the world.